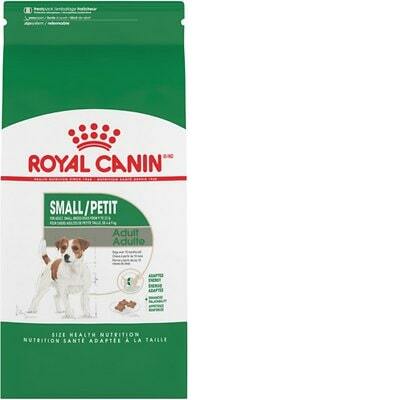 Royal Canin Size Health Nutrition Small Adult is a mid-priced dog food with lower-end quality. This product has 5 controversial ingredients. However, there are no artificial preservatives, colors or flavors. It has a high amount of carbs, compared to its protein and fat and the meat and fat quality in the food is mixed. Royal Canin has an above-average number of dog food recalls, but the company was very transparent when answering our questions. The average dog food we reviewed has 39 total ingredients, with 1 controversial ingredient. This product has 5 total controversial ingredients and 2 of them are found in the first five ingredients. This is concerning because the first 5 ingredients make up most of the product. An plant-based oil that is extracted from a mixture of seeds which contain Omega-6 and Omega-3 fatty acids. It’s commonly used to supply additional energy and flavor. However, since this ingredient is not specifically listing it's plant source it's not possible to determine the quality. 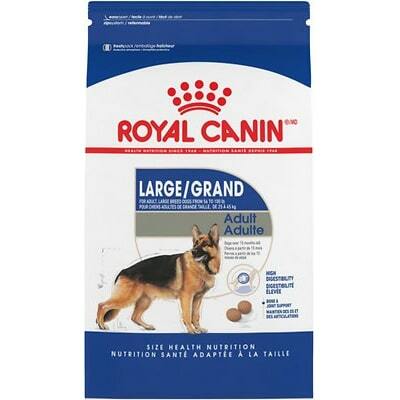 Royal Canin dog food is made in the United States. The strict safety laws and regulations here ensure a high minimum quality standard for dog food. Meat and fat ingredient quality varies here. The dog food includes Chicken By-Product Meal and Chicken Fat - both of which clearly show they’re made from chicken. But the food also uses added Fish Oil and Vegetable Oil, which are both of unknown origin. This makes their quality intransparent at best and questionable at worst. 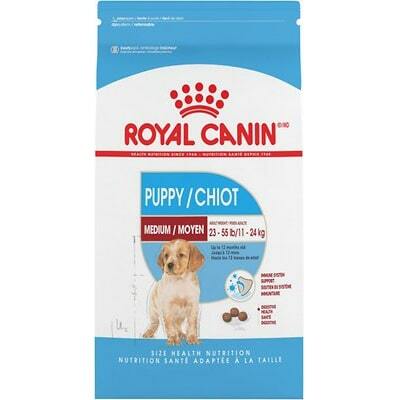 Royal Canin Size Health Nutrition dog food uses 0 controversial artificial preservatives, excellent. It’s good to know that ‍not all artificial preservatives are bad. That’s because they serve an important purpose, which is to prevent food from spoiling. However, we consider 11 artificial preservatives controversial because of their potential link to cancer and other serious health conditions. Royal Canin has an above-average number of dog food recalls. Royal Canin responded in 1 day, which is exceptional. There response was in the form of a brochure which had a lot of useful info. Follow-up questions were asked and almost all questions were answered. Formulations are determined by a team of veterinary nutritionists, PhD nutritionists and Masters of nutrition primarily stationed at the Royal Canin Research Campus in Aimargues, France, but also in a number of other countries. In Canada, veterinarians, a veterinary nutritionist, internists, Masters of nutrition, and animal health technicians are available to answer questions about nutrition and our products. We can’t provide their names as that is personal information we don’t release to the public. Using the knowledge gleaned from the Waltham Centre for Pet Nutrition, as well as the world wide body of research, the formulation team develops and validates new nutritional formulations at the Royal Canin Campus in Aimargues, France. There are over 100 dry and wet canine and over 90 dry and wet feline formulas. Most formulas have been validated according to AAFCO nutrient profiles and/or feeding trials though there are some special formulas with specific therapeutic formulations that preclude meeting the AAFCO nutrient profile. These formulas have all gone through alternate product testing, and many have been proven through clinical trials to be efficacious in managing the disease processes for which they were intended. All have been fed to either cats or dogs for long term trials, and the cats and dogs have thrived. Examples would be the Hepatic and Renal support formulas. The majority of the dry formulas for the Canadian market are produced at our facility in Guelph, Ontario. This facility is part of a network of plants in North America, where certain formulas may be assigned to specific plants for production to supply the entire North American market. For example, while every plant can produce any of the formulas, this unique network provides an opportunity for the facilities to specialize in some areas, improves efficiency of production, and enables us to continue to supply the market should there be a situation that resulted in supply interruption from a particular plant. The wet formulas are made in our wholly owned plant in North Sioux City, South Dakota. The plants are all dedicated to the manufacture of Royal Canin products. There is no third-party co-packing or subcontracting. The contracts, technologies, quality controls, and product testing that help ensure safety, nutritional precision and performance are in place at all of these facilities. And yes, tours can be arranged. Over 600 veterinarians, veterinary technicians, retailers, and professionals in the animal care field have visited the plant in Guelph since its opening. Product quality begins with the audit of every single ingredient from each supplier. We source local ingredients whenever possible, however ingredient safety and quality is prioritized over geography in our ingredient selection. Each ingredient prior to entering the facility must be subjected to analysis conducted by trained technicians to confirm quality and safety. The centerpiece of the plant’s laboratory in terms of product safety is the use of Near Infrared Spectroscopy (NIRS), an analytical test that compares the “fingerprint” of an ingredient to a database of standards (this database takes 3 years to establish). If the NIRS results for the incoming ingredient do not match the standard, then the ingredient is rejected prior to unloading. The manufacturing facility is composed of 3 separate, but interconnected parts. Each part is color coordinated: red zone for pre-cooking, yellow for cooking and blue for cooked. The manufacturing facility is designed in a vertical arrangement which allows for an energy efficient flow, while the computerized formulation management system ensures that every formula is created precisely. In the first area of the facility (red zone), dry ingredients are received and stored. All incoming ingredients are sampled and tagged to allow traceability - right to the source. To show further vigilance in this process, the ingredients in every bag of our formulas can be traced back to each stage of manufacturing, delivery and supplier. Ingredients are precisely weighed, ground and mixed to create a homogenous mixture. This mixture of ingredients is then delivered to the “kitchen” where heat and pressure will be supplied in the extruder to produce the kibble. A minimum temperature of 90oC is reached to ensure the control of bacteria, such as salmonella and listeria. In addition to this, over 500 salmonella tests are performed in our plant each week, including tests on finished products, environmental swabs, and environmental residues. This further monitors and protects against the most common cause of pet food recalls. Access to this area is strictly limited to skilled and authorized personnel only. Positive pressure, just as in veterinary surgeries, reduces the possibility of bacterial contamination. Pneumatic pressure moves the kibble to the dryer, which, again, is arranged vertically for greater energy efficiency and more uniform drying. The kibble descends through 7 graduated zones until the correct moisture content is achieved. The Royal Canin finished product is packaged in the 3rd area of the facility. Metal detectors are used during the process to provide a final safety check before the kibble is packaged. As the bags are filled, nitrogen is forced into the packaging to displace oxygen. Consequently, once the bag is sealed, there is minimal contact between the kibble and oxygen. This process ensures the food maintains a higher degree of freshness and palatability. To enhance the level of biologic vigilance employees cannot move freely from one painted zone to the other. Employees and tools working in the red zone cannot cross into the blue zone. The blue zone defines the area of the plant involved with finished product and packaging which has been sterilized by the extruder. Employees in the plant are required to wear special footwear, hair nets and clothing and require hand sanitization before entering the blue zone. Our safety measures however, do not end there. The Americas satellite laboratory situated in Guelph, Ontario, is a state of the art laboratory that conducts detailed analyses on all ingredients and finished product from plants in North and South America. This lab is integrated with labs in Asia and France, ensuring the quality and safety of all Royal Canin products worldwide. The consequence of this remarkable technology from start to finish is that pet owners can be assured that Royal Canin products are free of any contamination and are 100% safe. We feel that the most comprehensive approach to ensuring the quality and safety of our ingredients centers around conducting stringent tests on the ingredients at multiple stages of production rather than focusing on country of origin. All ingredients that are utilized are tested for melamine and related derivatives, bacteria, mycotoxins, heavy metals, etc… prior to be allowed to enter our manufacturing facilities. Finished batches are also tested once again for any harmful substances prior to being packaged and distributed. In addition, we regularly audit our suppliers to be sure they are complying with our demands and meeting our quality and safety standards. Because of this, we do not have a set list of where each and every ingredient may be sourced from. We are unable to provide the level of detail to determine which, if any, ingredients are sourced from other countries. While this may be an honest answer, it is not a transparent answer.